When you buy a Chromebook, it usually comes with a two year upgrade of an extra 100GB on your Google account. What I didn't know, was if you could use the promotion again after the two years ended. For example, I signed up for a free preview of YouTube Red a while back. When the preview was over, I happened to have a Chromecast and there was a promotion for a free month of YouTube Red for Chromecast owners. Unfortunately, I couldn't sign up for that, because I was no longer considered a "new" subscriber. In 2014, I received a chromebook that had a bonus 1TB upgrade for Google Drive for two years. I gave it a try and the two years ran out very recently. Before it ran out, I bought a new chromebook. I'll skip the story of why I did this. What matters is this: It also had a bonus 100GB on Google Drive for two years. So when my two years of the 1TB upgrade ran out, I went to the Chromebook Goodies website from the new chromebook to see if I could redeem the offer. At worst, it would only be for new users, like the YouTube Red promotion mentioned above. Fortunately, I was able to redeem the offer. It seems that Google doesn't care if you're a new user or an existing one -- only that you bought a chromebook. So if you're the kind of person who would pay $2 each month for the 100GB of extra storage, then this is like an extra $48 off the cost of the chromebook every two years. I've seen decent chromebooks for as little as $200, so this can be a significant fraction of the cost. Even some of the nicer chromebooks are in the $300-$400 range, which would make this a 12% - 16% discount. Side note #1: Keep an eye open for a "security checkup" deal with Google in February. In February 2015 and 2016, they offered an extra 2GB of storage for anyone who did this. I did it both times and I now have 19GB of free space in my account, in addition to the 100GB promotion from my chromebook. (Yes, a total of 119GB of storage for things I was going to do anyway.) The security checkup was a series of questions that you should probably check on anyway, so I highly recommend doing this if they offer it again in February of 2017. Side note #2: If you have an old G Suite account from when they were free (back when it was just called "Google Apps" and they gave you 100 free accounts), this promotion will work. I'm using it with my account, which I registered in 2008. You need to graph your Internet usage, if not all network usage. I'm surprised I didn't write about this sooner. I talk about it frequently. It is one of the steps that separates a professional network or system administrator from someone just trying to keep things running. So let's dig into this. A: "Things seem slow sometimes; especially during business hours. I believe that we should pay for a bigger Internet connection in order to address this." B: "Here is a graph of our Internet usage over the last week. The dotted line across the top is what purchase from our ISP. The green line is our actual usage, with readings taken every 5 minutes. As you can see, our usage curves upward over the first hour that we're open and then hits the dotted line. Then we stay there until shortly after we close. Based on this data, I believe we should pay for a larger Internet connection." I'm sure you can imagine other situations similar to these, but here are a few more: Justifying replacement of 100Mbps switches with 1000Mbps switches. Tracking down which device is flooding your network with poorly configured multicast traffic (rendering it useless for everyone else) in about 10 minutes. Figuring out if the lag you're experiencing is network congestion on your servers or a "full" Internet connection or if you just have too many devices on too few wireless access points. These are all situations that you might really face. They're all situations that you can handle with aplomb if you set up network graphing. By looking at graphs of how much traffic is going through each switch in your network, you can quickly spot patterns that might otherwise be invisible. If you don't know where to start, then I recommend checking out Cacti. By installing it on a server of your choice, you can start building graphs through a web app. For example, I started up my favorite free Unix-like system (FreeBSD) on a virtual server, installed Cacti quickly from the FreeBSD ports collection, added SNMP version 1 / read-only community names to all of my switches (easier than it sounds,) and started adding them to Cacti through a nice web-based interface. It was surprisingly easy, even though it took some time. I'd recount how to do it for you, but the reality is that other people on the Internet have already done a better job. Find a guide for your preferred server OS and give it a try. The bottom line here is this: Even the most talented systems administrator doesn't know about the things they're not measuring. Make your systems measure themselves so you can make better decisions -- especially when speaking to your manager or anyone with the ability to shape the budget. If you're not sure where to start, try Cacti, because it's free, not overwhelmingly complex, and has enough ability that many professionals prefer it to the commercial products. 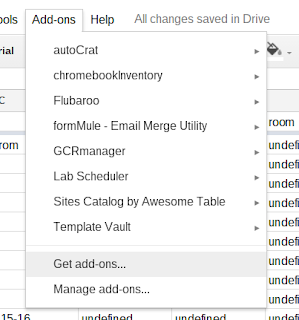 Recently, I mentioned the GCRmanager add-on for Google Sheets to an online group and was surprised at how many people didn't know about it. So I thought I should share it here. 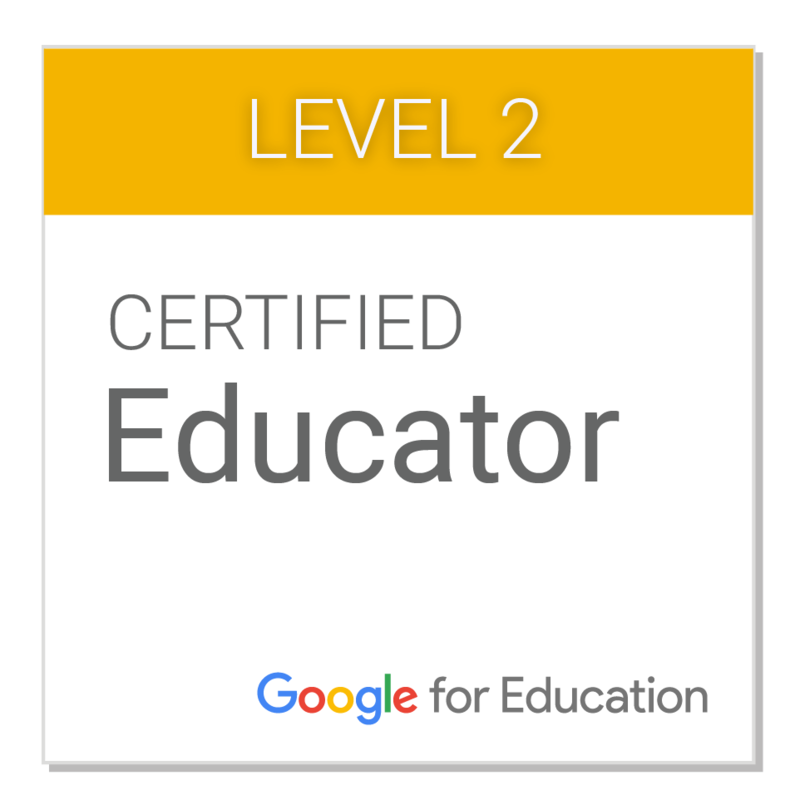 If you have Google Apps for Education (GAfE,) you have access to Google Classroom. It isn't as feature-filled as Moodle, Blackboard, Schoology, et. al. However, it is very effective. I spent years trying to get teachers into using Moodle, for example. It offered so many options that the average teacher didn't know how to leverage it. It was like going to a restaurant and being given an 18 page menu. It can be daunting, especially now that teachers are overloaded with so much red tape. 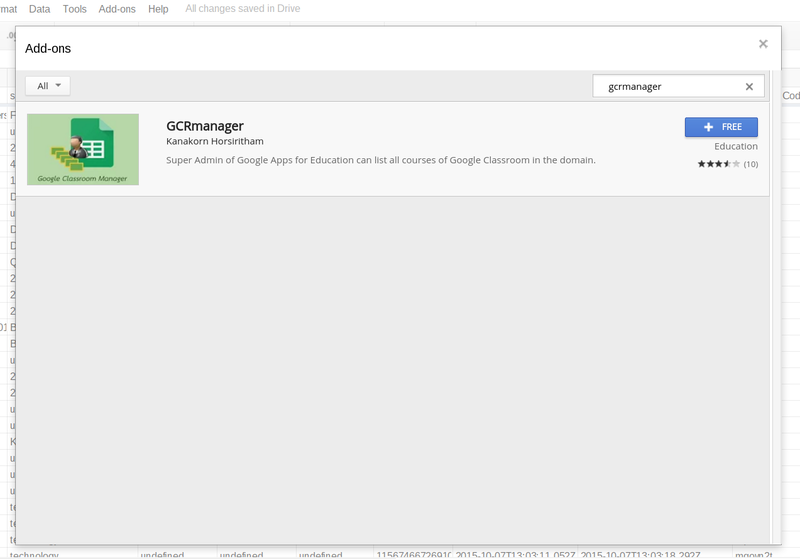 When Google Classroom was released to all GAfE customers in summer 2014, it was amazingly simple and direct. I told my faculty, "It makes what you are already doing with Drive easier." And with that, it took off. We had lots of teachers trying to find ways to make life easier -- handing out worksheets, collecting essays, making announcements, and giving students a way to pick topics for the next assignment off a list. The quirky thing was this: The same simplicity that made Classroom catch on with teachers also made it hard to get a "big picture" look at things. As the head of Information Technology and an adviser to school administration, I wanted to be able to say how many teachers used it recently, how many used it at all, and how many didn't even try. Fortunately, someone made GCRmanager. 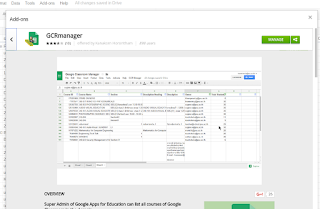 GCRmanager is an Add-on to Google Sheets. To get it, open a new file in Google Sheets. 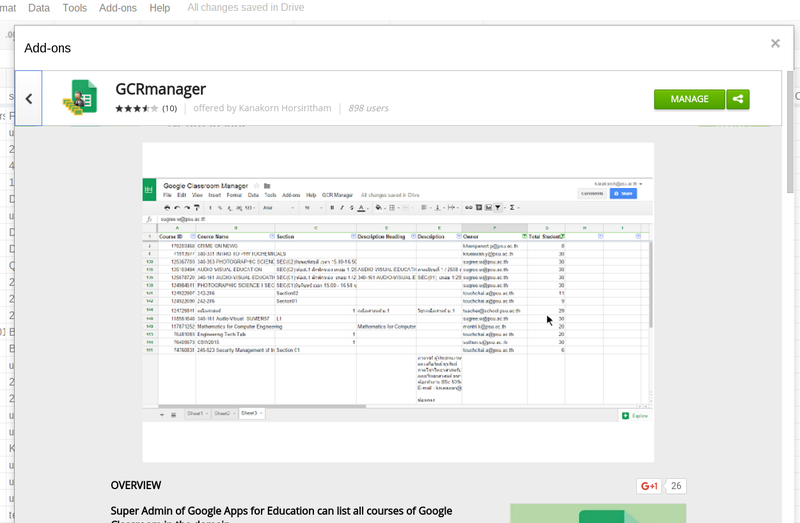 Then go to the menu bar, click on "Add-ons", and then "Get add-ons..." At this point, you'll be given an app-store-like experience that shows tools to extend Google Sheets. 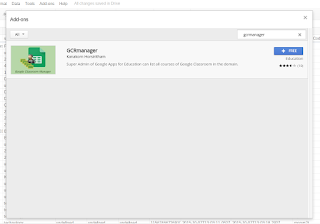 Search for "GCRmanager" and add it. Then close the Add-ons window. 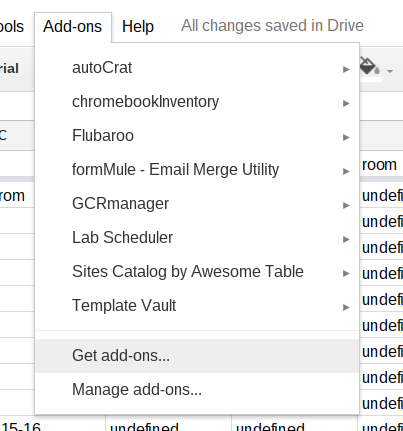 This adds "GCRmanager" to your Add-ons menu inside any and all Google Sheets files. Since you're still in an empty Sheets file, now is the time to give GCRmanager a try. 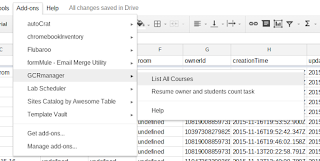 Just click on "Add-ons", then "GCRmanager", then "List All Courses." This will take a while to finish. Possibly a long while. Give it time. 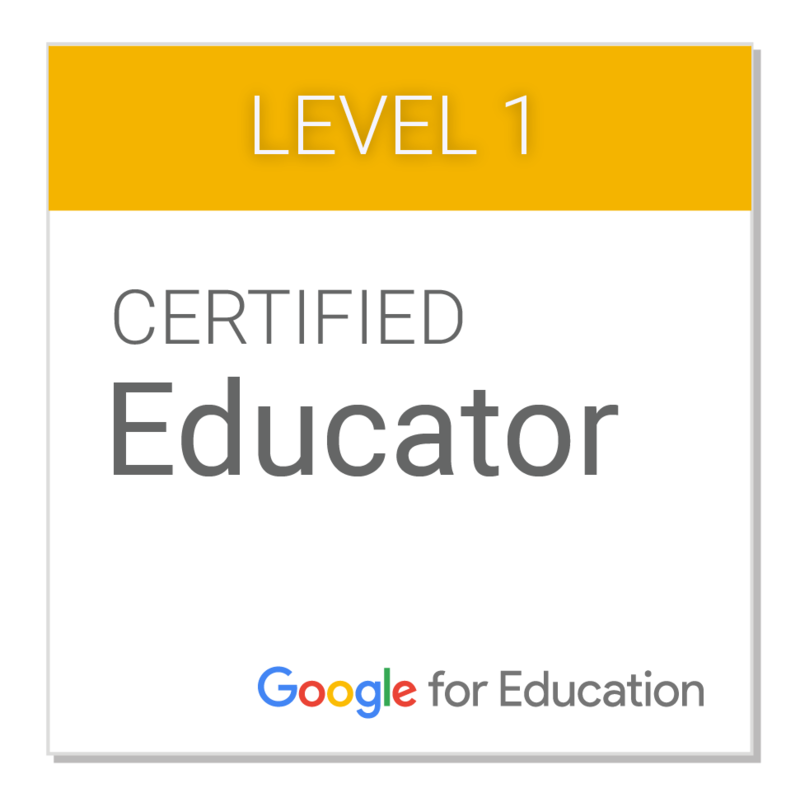 When it is done, you'll have a line on the spreadsheet for every Google Classroom "class" that was created in your GAfE domain. It will include a lot of data you probably don't care about, like class ID# and owner ID#. It will also contain a lot of interesting information, such as the classes' owners, date created, date last updated, how many students are enrolled, if it is still active or archived, etc. 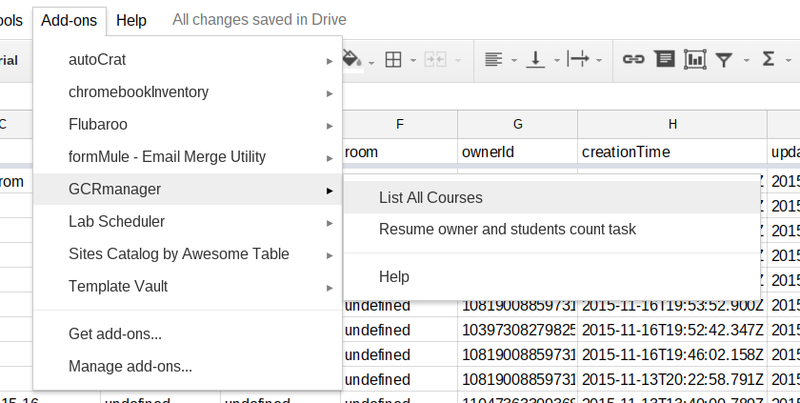 Assuming that your faculty is using sensible class names, the name, section, descriptionHeading, description, and room columns could be useful, too. At this point, you can keep the Sheets file for reference of Classroom usage at that point in time and make new files from time to time. The excellent Stephen Gale shared a great tip recently on Google+. I do this via a shell script in Deploy Studio. In fact, I actually use a really nice script (see link below) with execution delayed until after first restart. This makes sure that the system is booted from the internal drive when the script is executed. This could also be done by a scripting (or a postflight script in a PKG installer) delivered via Apple Remote Desktop (ARD), Munki, Casper, FileWave, etc. This technique would work well if you needed to implement this change on a set of Macs that were already in service. If you use ARD, I recommend taking the additional step of adding the script to your setup process in Deploy Studio, Munki, etc. In the case of Munki, Casper, FileWave, etc. you're probably already in good shape. Just see if there is a way to schedule the script too execute early in the list of things to be installed. Otherwise, someone may login to the Mac before the script it loaded. For example, in FileWave you could set to activation date to be before any other filesets. For a really good implementation of this idea, check out the script on this excellent post. The author does a great job of adjusting every existing user template and account on the Mac. So if you create local accounts (e.g. "student", "teacher", etc.) then this is a way to address that use-case as well. If you use Deploy Studio to image a Mac and CreateUserPKG to create accounts, just be sure to add this script to the workflow after the step with the user packages. I like this script because it is very adaptable. Whether your accounts are on the local drive or a network system like Open Directory or Active Directory, the script takes it all into account. This reduces the chances of problems if/when you have to change your account management in the future.